Welcome to Dominos pizza delivery boot camp. Here we will teach everything you’ll need to know about Domino’s pizza from delivery areas, hours, charges per delivery and even how you can secure a job at Domino’s. Domino’s Pizza is currently the second largest chain of pizza diners after Pizza Hut. Domino’s Pizza is a chain of restaurants headquartered in Ypsilanti, Michigan. The first Domino’s restaurant was opened 55 years ago, on the 10th of June 1960, after co-founders Tom Monaghan and James Monaghan purchased a small pizzeria located at the Eastern Michigan University. With a net income of 306.2 million dollars per year and a revenue of 2.2165 billion dollars, Domino’s Pizza is the second largest chain of pizza restaurants after Pizza Hut. Since the Monaghan brothers purchased the small pizzeria back in the ‘60s, the brand expanded into 70 countries, including the United Kingdom, Malaysia, Romania, and India. At the last headcount, the chain reported over 200.000 employees. Ordering from Domino’s Pizza is pretty easy, although there are a couple of things you should keep in mind before choosing this brand over all other. First of all, Domino’s philosophy rests on low prices and quality products. This means that before ordering something from Jerry’s or Pizza Hut, check out Domino’s menu. The chances are that you’ll find the same type of pizza, but a much lower price. Also, Domino has a habit of offering discounts, especially for clients who place their orders online. How to order from Domino’s Pizza? Either head on over to one of their restaurants, order over the phone or use the online order sheet. With locations covering all of United States, it’s very likely that there is Domino’s joint in your neighborhood without you knowing it. Placing an order at any of their physical locations is easy, the prices are excellent, and there’s virtually no waiting time. Probably the most used ordering method out there is over the phone. It’s convenient and when you’ve got no Internet access it’s the best way to place your order. Just look over the menu, take your pick in pizza, add some extra toppings, a side dish, a sauce and maybe a drink and place your order over the phone. Here’s a full list of Domino’s Pizza phone numbers for each US state and major city. Note that by placing your order via phone you might miss out some pretty impressive discounts. For additional information, you can always reach Domino’s point of contact by (734) 930-3030 or by mail at Domino’s Pizza LLC, 30 Frank Lloyd Wright Drive, Ann Arbor, MI 48106. In order to place an online order, head on over to the “order online” section, which can be found at the top of the page. A sign-in window will appear, which will ask you to either log in if you already have an account or create a new one. Creating a new account is very easy: just fill in the blanks with your last name, first name, email address, a password. Additionally, the site will ask you a couple of delivery details like the name of the street, the street’s number, floor, apartment’s number city and a phone number in order to confirm your order. If the name of the street doesn’t appear in the drop-down box, you can move a pin on a map in order to tell Domino’s where you want your order to be delivered. After you sign-in, go to the menu page and compose your meals any way you see fit. From time to time, Domino’s Pizza offers discounts to all clients who place their order online. Moreover, customers can also buy promo codes and coupons from either Domino’s official web page or food partners. These promo codes can be introduced in the online order sheet and work only once. However, according to Domino’s disclaimer, customers are unable to accumulate discounts. This means that if a product is at a 50 percent discount, you won’t be able to apply any discount. When the order is finished, an employee from Domino’s will call to confirm your order. After that, sit back, relax and check out your order’s progress by clicking the tracker bar. 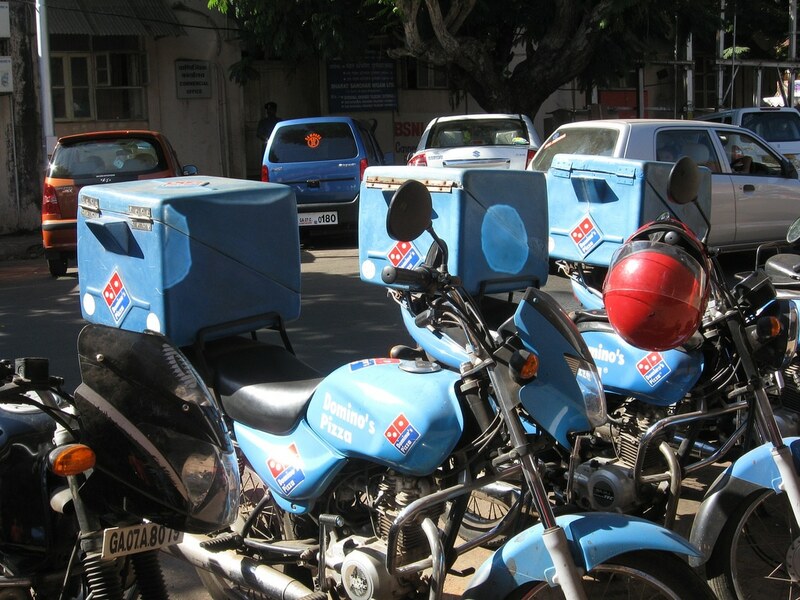 According to Dominos pizza delivery page, all delivery hours vary by location and traffic. This means that all the delivery hours should be taken as guidelines not deadlines. Another great thing about ordering from Domino’s is that both their locations and delivery services are available every day of the week. Monday: from 10:30 a.m. to 12:00 a.m.
Tuesday: from 10:30 a.m. to 12:00 a.m.
Wednesday: from 10:30 a.m. to 12:00 a.m.
Thursday: from 10:30 a.m. to 12:00 a.m.
Friday: from 10:30 a.m. to 1:00 a.m.
Saturday: from 10:30 a.m. to 1:00 a.m.
Sunday: from 10:30 a.m. to 12:00 a.m.
For more information about delivery hours and locations, head on over to Domino’s Pizza location section and search for your location either using the map or by entering your zip code. You can redeem coupons and promo codes from Domino’s Pizza official website or by visiting Domino’s online partners. These vouchers can range anywhere from one large pizza with three toppings for 12 dollars to two menu item for only six bucks. Keep in mind that you can use these coupons or promo codes only once. After the promo code was verified and the order place, you won’t be able to use the same code in a different order. Luckily, there are tons of coupons just waiting to be redeemed. To guarantee that Domino’s Pizza can deliver to your location, you can always check out delivery.com for more information. Also, some Domino’s diners have a 24/7 delivery policy. In order to see if Domino’s can deliver any specials, place a call to a restaurant and pop the question. This is all you need to know about Dominos pizza delivery. Hey Buddy!, I found this information for you: "Dominos Pizza Delivery 101: Areas, Hours, Fees". Here is the website link: https://all2door.com/dominos-pizza-delivery-101-areas-hours-fees/. Thank you.